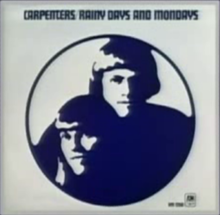 (1971) "Rainy Days and Mondays"
"Rainy Days and Mondays" is a 1971 song by the Carpenters, with instrumental backing by L.A. session musicians from the Wrecking Crew, that went to number 2 on the Billboard Hot 100 chart, It's Too Late/I Feel the Earth Move by Carole King kept it from number 1. "Rainy Days and Mondays" was the duo's fourth number 1 song on the Adult Contemporary singles chart. However, the song failed to chart in the United Kingdom until it went to number 63 in a reissue there in 1993. "Rainy Days and Mondays" was certified Gold by the RIAA. The song was composed in 1971 by the then fairly unknown composers Roger Nichols and Paul Williams. It was released as the first track on the album Carpenters, popularly known as the Tan Album, and the B-side on the single is "Saturday", written and sung by Richard Carpenter. ^ "flavour of new zealand - search listener". Flavourofnz.co.nz. Retrieved 2016-10-05. ^ "Top 100 Hits of 1971/Top 100 Songs of 1971". Musicoutfitters.com. Retrieved 2016-10-05. ^ Billboard. Books.google.co.uk. 1971-12-25. p. 15. Retrieved 2016-10-05.